While packing up my house this summer, I stumbled across this gem. 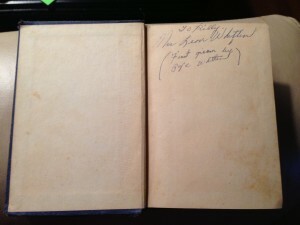 This 102 year old book entitled “Grace Before Meals” was given to my grandmother by my great grandfather, Papa Whitten. I love that my grandmother’s handwriting is on the inside. 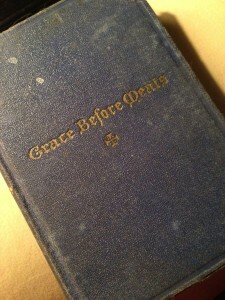 But among the pages of this tiny book lie secrets to the lost art of saying grace before meals. The prayers are brief and eloquent. They are timeless and true. And it is a treasure I’ve been wondering what to do with for months. Each Thursday I will post one of the prayers from the book. I’ll replace the thee-s and thy-s, the unto-s and the thou-s; but otherwise, the prayers will remain unchanged. My hope is that once a week you will find new words to express your gratitude not only around the dinner table but throughout your days as well. Posted on January 3, 2013 by Nikol. This entry was posted in Giving Thanks. Bookmark the permalink.